Follow the data sources' instruction for data downloading. File must be under 30 mb. We have successfully processed your genotype profile. Please click the button below to access your report. The file is not compatible with Polygenic Alzheimer's Disease risk analysis. Dash Genomics has partnered with HealthLytix to bring you a new model to understand your individual risk of Alzheimer’s disease using 23andMe and Ancestry.com data. Based on research from UC San Diego and UC San Francisco, this model estimates your personalized risk as a function of age and your genetic information. Learn more about our product and see a sample of our report. The proprietary algorithm used by Dash Genomics was developed by HealthLytix, a precision health company in San Diego, and is based on cutting-edge research from UC San Diego and UC San Francisco. The research looks at age-specific risk of developing Alzheimer’s disease based on genetic markers that have never been used before for estimating risk. Individual genetic risk of Alzheimer’s disease is quantified based on your genetic markers and age. The model looks at the similarities between your genetic profile and the average risk in the group analyzed in the research. Find more details about the research team’s analysis, including methodology and findings, in their published research papers. We can not find the email in our records, please use the email address that you used to register the account. Thanks. Your password was successfully updated. Please click here to see your report. Your account email has been verified. Please login to access your report. Your password has been successfully reset. Please login with your new password to view your report. Your account could not be verified. Please enter your email address to receive a verification email. You still need to verify your account. Please enter the email address you used to sign up and we will send you a new verification email. Email not found. Please enter the email you used to sign up. Reset request is no longer valid. Click here to request another reset email. Why should I order this analysis? Although symptoms of Alzheimer's disease usually onset in the later stages of life, the brain begins changing 10-20 years before. The age of onset for an individual with low risk versus one with high risk can vary by as much as 15 years or more based on research conducted by UCSF and UCSD. Understanding the latest research and similarities of your genetic profile to research cohorts can help continue your journey in learning about your genetic risks for Alzheimer's Disease. Once you know more about the risk of Alzheimer's disease, you can make more informed lifestyle changes. Although these have not yet been clinically validated or formally approved by the medical community, some early research studies suggest lifestyle changes can improve outcomes for those with Alzheimer's disease, including physical exercise, diet, social connections and intellectual activity. Learn more at Alzheimer's Association. How are we different from other APOE based risk analyses? Dash Genomics offers the ONLY Alzheimer's disease risk algorithm that goes beyond the APOE gene. It's more EXTENSIVE. Other APOE offerings only report the risk based on the genotypes of 2 loci (rs429358 and rs7412) within the APOE gene. Dash Genomics considers not only these 2 loci but also looks into as many as 600,000 loci in your genome that may contribute to the genetic risk of Alzheimer's disease based on the research model. It's QUANTITATIVE. Only Dash Genomics' analysis estimates the risk of Alzheimer's disease as a function of age. 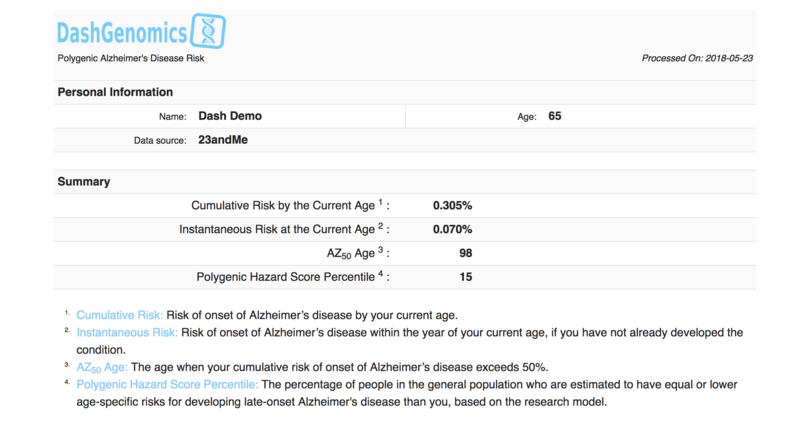 At any given age, Dash Genomics provides the risk of Alzheimer's disease onset by this age (Cumulative risk) and within the year of the age (Instantaneous risk) based on the research model. The analysis also estimates the percentage of people who have lower/higher risk than you (Polygenic Hazard Score (PHS) percentile). It's INTUITIVE. 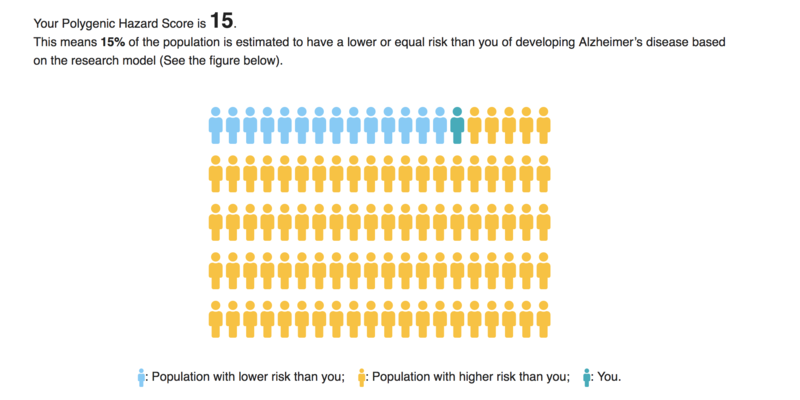 Dash Genomics' Alzheimer's risk report provides charts, tables and quick tips to help you understand different aspects of your risk profile easily. See a demo report. *For people younger than 60, the risk will be based on the age of 65. Based on the similarity between your genetic information to that of the research cohort analyzed, learn about your risk of developing Alzheimer’s Disease by a specific age -- your 'cumulative risk.' Compare your information to the average for different age groups. Understand your risk of developing Alzheimer’s Disease at a specific age - your 'instantaneous risk'. Again, this estimate is based on the similarity between your genetic information to that of the research cohort analyzed. Compare your information to the average for different age groups. Want to zoom into the next few years? Based on your current age and genetic profile, explore your risk of developing Alzheimer’s Disease in the next 5 years. This profile will evolve over time. *Only available for people who are older than 60. Compare your personalized risk to the general population. Your Polygenic Hazard Score (PHS) percentile presents the percentage of people in the general population who have equal or lower age-specific risks for developing the late-onset Alzheimer's disease than you based on the research model. APOE is one of the critical genes that are associated with varying levels of risk of developing Alzheimer's disease. APOE-ε4 (APOE4) is the subtype of the APOE gene with an increased risk. We provide the status of the APOE gene and the number of APOE-ε4 copies based on your raw data*. *For the data from Ancestry, we impute (infer the values for) the genomic loci that determine APOE subtypes based on other parts of your genome. Dementia affects around 50 million people worldwide, with nearly 10 million new cases each year. Alzheimer’s disease is the most common form of dementia, accounting for 60-80% of cases. The condition is often associated with loss of memory, confusion, and the decline of other cognitive functions. Alzheimer’s disease can be influenced by a number of factors including genetics, lifestyle and environment. Late Onset Alzheimer’s disease is the most common form of Alzheimer’s disease, which develops after the age of 65. Research suggests that by 80 years of age, over 10.3% of individuals face the onset of Alzheimer's disease. Our partner, HealthLytix, a precision health company based in San Diego, has developed a new model, based on research from University of California San Diego and University of California San Francisco, that estimates your personalized risk of developing Alzheimer’s disease as a function of age based on your genetic information (subject to the limitations described below). Dash Genomics has worked with HealthLytix to bring this analysis to anyone who has had their genetic information provided by either 23andMe or Ancestry.com. Science - How Does it Work? Your Genetic Data. To estimate your Alzheimer's disease risk, we imported your data from and analyzed your data using the model developed by HealthLytix. This model is based on research that originally looked at 33 loci near 28 genes and the list of genes/loci evaluated as part of this research can be found in the work published by UC San Diego and UC San Francisco. The HealthLytix team has since expanded the algorithm to look at up to approximately 600,000 high quality loci that are commonly found in 23andMe and Ancestry.com data files. In certain cases, because data might not cover all the genotypes of the critical genetic loci that are used in the algorithm or because it contains known or perceived errors, we impute (infer the values for) certain genetic loci based on other parts of your genome. Research Model. HealthLytix’s proprietary algorithm used for this analysis was developed based on research from UC San Diego and UC San Francisco to assess age-dependent risk of developing Alzheimer’s disease. While previous research has identified certain genetic markers associated with Alzheimer’s disease (such as APOE), the genetic markers newly identified by our partner researchers have never before been used to estimate risk. This analysis estimates individual genetic risk of Alzheimer’s disease based on a person's genetic markers and age by looking at the similarities between your genetic profile and the risk of genetic profiles in the patient research cohort analyzed. You can find details about the research team’s analysis, including methodology and findings, in their published research. Cumulative Risk: Risk of onset of Alzheimer’s disease by your current age. Instantaneous Risk: Risk of onset of Alzheimer’s disease within the year of your current age, if you have not already developed the condition. AZ50 Age: The age when your cumulative risk of onset of Alzheimer’s disease exceeds 50%. Polygenic Hazard Score Percentile: The percentage of people in the general population who are estimated to have equal or lower age-specific risks for developing late-onset Alzheimer's disease than you, based on the research model. APOE status: The combination APOE subtypes of 2 copies of the APOE gene in your genome. These values were imputed (inferred value) for your genome. Individual genetic risk of Alzheimer’s disease is quantified based on your genetic markers and age. 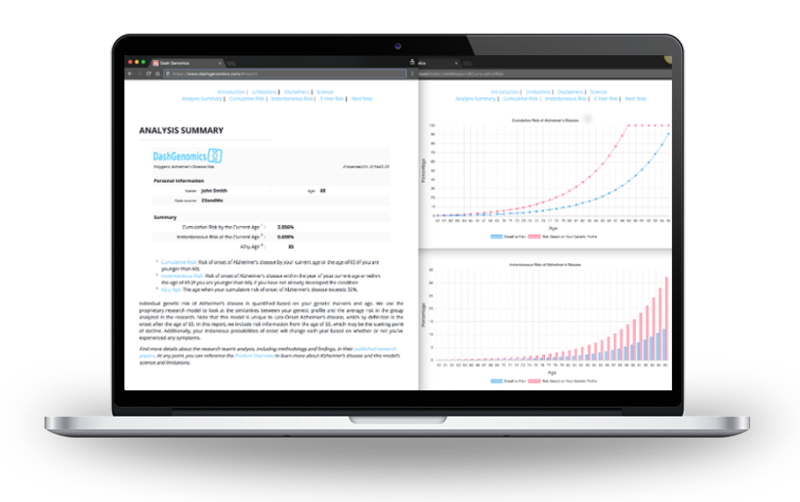 We use the proprietary research model to look at the similarities between your genetic profile and the average risk in the group analyzed in the research. Note that this model is unique to Late-Onset Alzheimer’s disease, which by definition is the onset after the age of 65. In this report, we include risk information from the age of 60, which may be the starting point of decline. Additionally, your instanteous probabilities of onset will change each year based on whether or not you’ve experienced any symptoms. Find more details about the research team’s analysis, including methodology and findings, in their published research papers. At any point, you can reference the Product Overview to learn more about Alzheimer’s disease and this model’s science and limitations. Cumulative risk is a measure of the probability of onset of Alzheimer’s disease by a certain age based on the similarity of your genetic profile to the research population. Q: What does cumulative risk mean? Cumulative risk is measured by looking at the number of incidences (i.e. onset of Alzheimer’s disease) among people with similar genetic profiles to you in the research cohort studied over a specific time period (e.g. 70 years). As a simplified example, let’s assume that the research cohort studied had 1000 people with the same relevant genetic profile as you. If, upon analyzing the number of occurrences of onset of Alzheimer's disease up until the age of 70, we only observed one person in this group who had the onset of Alzheimer's disease, then the incidence ratio to the total population at risk over 70 years is 1/1000, which represents a cumulative risk of onset of Alzheimer's disease by the age of 70 at 0.1%. The table and figure below provide (a) your cumulative risk (in gold) of developing Alzheimer’s disease at any point up to and including a certain age based on your genetic profile and its similarity to the research cohort and (b) the baseline or "average" cumulative risk (in blue) based on the average of the research population as a whole. Instantaneous Risk is a measure of the probability of onset of Alzheimer’s disease within a given year, assuming you have not yet experienced the disease. Q: What does the instantaneous risk mean? Instantaneous risk is also called the "annualized incidence rate," which represents the estimated proportion (in percent) of individuals with a similar genetic profile and age as yours who have not yet developed Alzheimer’s disease but will develop it within the year of each given age. For example, if you are years old, the expected incidence rate for your age group as a whole (the baseline risk) is , meaning of people in this age group generally experience the onset of Alzheimer’s disease during the age of . With this model, assuming that you are years old and have not already developed Alzheimer’s disease, for people with similar genetic profiles as yours, the probability of onset of Alzheimer’s disease in the current year is instead estimated to be . The table and figure below provide (a) your instantaneous risk (in gold) or probability of developing Alzheimer’s disease during each given age calculated based on your genetic profile and its similarity to the research cohort and (b) the baseline or "average" instantaneous risk (in blue) based on the average of the research population as a whole. The graph below provides your estimated risk over the next five years of developing Alzheimer’s disease. It is generated through our research model and by combining the estimates for risk of onset by or at a certain age -- based on looking at the similarities between your genetic profile and the risk of genetic profiles in the patient research cohort analyzed. In this chart, your initial risk is reset to 0, assuming that you have not had any symptoms of Alzheimer's disease by the current age. Polygenic Hazard Score(PHS) for late-onset Alzheimer’s disease is a new polygenic model for determining the risk of Alzheimer's disease that accounts for multiple genetic loci (beyond APOE status) and their weights associated with risk based on research cohorts. Q: What does a Polygenic Hazard Score (PHS) percentile mean? Your Polygenic Hazard Score (PHS) percentile, ranging from 1 to 100, represents the percentage of people in the general population who have equal or lower age-specific risks for developing the late-onset Alzheimer's disease than you based on the research model. 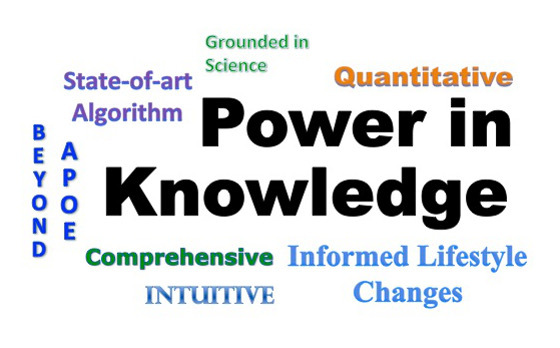 For an individual whose PHS percentile is 1, it means that at any given age, only 1% of people are estimated to have an equal or lower risk of developing the Alzheimer's disease than the individual. A PHS percentile of 99 implies that 99% of people are estimated to have an equal or lower risk than such individual. An individual with a high PHS percentile is estimated to have a higher risk than the one with a low PHS percentile, at any given age. Your Polygenic Hazard Score is 75. This means 25%% of the population is estimated to have a lower or equal risk than you of developing Alzheimer’s disease based on the research model (See the figure below). : Population with lower risk than you; : Population with higher risk than you; : You. The APOE gene provides instructions for making a protein called apolipoprotein E. This protein combines with fats (lipids) in the body to form molecules called lipoprotein, which help control the levels of cholesterol and fats in the blood. Q: What are the different APOE forms? The APOE gene has three relatively common forms defined by two SNPs, rs429358 and rs7412. These forms are known as APOE-ε2 (APOE-e2), APOE-ε3 (APOE-e3), and APOE-ε4 (APOE-e4), and encodes the proteins APOE2, APOE3, and APOE4 respectively (See the table below). APOE-ε3 is the most common form 1, followed by APOE-ε4 and APOE-ε2. Research has suggested that having the APOE-ε4 form increases one’s risk of developing Alzheimer’s disease more than having only APOE-ε2 or APOE-ε3 form; those who inherit two copies of the APOE-ε4 form have an even higher risk 2 - 4. In addition, those with the APOE-ε4 form are more likely to develop Alzheimer’s disease at a younger age than those with the APOE-ε2 or APOE-ε3 forms 5. A meta-analysis 6 including 20 published articles describing the frequency of the APOE-ε4 form among people in the United States who had been diagnosed with Alzheimer’s found that 56 percent had one copy of the APOE-ε4 gene, and 11 percent had two copies of the APOE-ε4 gene (see figure below). Q: What is APOE status? Each person inherits one copy of the APOE gene in a certain form from each parent. The combination of the 2 copies of the APOE forms represents the APOE status (See table below). *Percentages do not total 100 due to rounding. Q: What does “imputed” mean? Why do the genotypes of APOE loci in my genome need to be imputed? Imputation in genetics refers to using a statistical approach to infer the genotypes of missing loci with known genotypes of other loci in the genome that are generally inherited together. When you see that APOE genotypes are imputed in your report, it means the original raw data file either does not have this genotype information or the genotypes provided are believed to contain errors based on researchers’ analyses. In those cases, other loci in your genome are used to infer (impute) the genotypes of the APOE loci, rs429358 and rs7412. It is a known issue for Ancestry.com users that the raw data file often fails to include or may misreport the genotypes for APOE status (see here). Thus, to identify the APOE status, the genotypes of rs429358 and rs7412 are imputed based on genotypes of other loci in your genome. Although genotypes with high correlations with this particular APOE status are used, imputation may not always be accurate, and accordingly, your actual APOE status may differ from what is presented here. Dash Genomics has not independently verified any of the genotypes reported by Ancestry that are used for the imputation process. Mahley RW, Rall Jr. SC. Apolipoprotein E: Far more than a lipid transport protein. Annu Rev Genomics Hum Genet 2000;1:507-37. Loy CT, Schofield PR, Turner AM, Kwok JBJ. Genetics of dementia. Lancet 2014;383:828-40. Holtzman DM, Herz J, Bu G. Apolipoprotein E and apolipoprotein E receptors: Normal biology and roles in Alzheimer disease. Cold Spring Harb Perspect Med 2012;2(3):a006312. Alzheimer’s Drug Discovery Foundation. What APOE Means for Your Health. Available at: http://www.alzdiscovery.org/cognitive-vitality/what-apoe-means-for-your-health. Accessed September 27, 2017. Ward A, Crean S, Mercaldi CJ, Collins JM, Boyd D, Cook MN, et al. Prevalence of apolipoprotein e4 genotype and homozygotes (APOE e4/4) among patients diagnosed with Alzheimer’s disease: A systematic review and meta-analysis. Neuroepidemiology 2012;38:1-17. Spinney L. Alzheimer’s disease: The forgetting gene. Nature 2014;510(7503):26-8. Raber J, Huang Y, Ashford JW. APOE genotype accounts for the vast majority of AD risk and AD pathology. Neurobiol Aging 2004;25:641-50. * APOE status is determined based on your raw data file provided by 23andMe. We have not independently verified any of the information provided by 23andMe.We have imputed genotypes of rs429358 and/or rs7412 in such cases where the genotype was not reported in the 23andMe raw data file. We report your APOE status above based on the imputed genotypes. For reference, your actual 23andMe raw data file reported the following genotypes: rs429358 () and rs7412 (). We have imputed genotypes of rs429358 and/or rs7412, because of a known issue for Ancestry.com users where the raw data file may fail to include or may misreport certain genotypes for APOE loci. We report your APOE status above based on the imputed genotypes. For reference, your actual Ancestry.com raw data file reported the following genotypes: rs429358 () and rs7412 (). As noted in the initial warning you received, imputation will be less accurate than normal for your particular raw data file. ** Number of copies of the APOE-ε4 form of the APOE gene in your genome. Remember, this analysis has not been validated for clinical or medical use and although this model looks at the similarity of your genetic information to the research cohort, none of the information presented here should be viewed as definitive regarding your Alzheimer’s disease risk or whether you will or will not get Alzheimer’s disease. Always consult with a medical professional before taking any actions related to your health. Have questions on the genetic information related to this research? You can find and contact a genetic counselor by visiting the National Society of Genetic Counselors. Once you create an account, you can upload your data and get immediate access to your results. I have my genomic data file from 23andMe or Ancestry.com*. * We support all 23andMe and Ancestry raw data files, but note that certain Ancestry files require us to impute (infer the values for) the genotypes of certain important genetic loci from other parts in your genome - which can affect accuracy. Account already exists. Please log in instead. Your payment could not be processed. Please double check that all your information is accurate. Access your results immediately by uploading your compatible data file. You will receive a confirmation email shortly. Please follow the instruction to verify your email and access your account. We are working hard to fix the issue.